Available from online vendors so I will not be posting a sample. Posted here to add scans of the book-fold cover. Great fun. 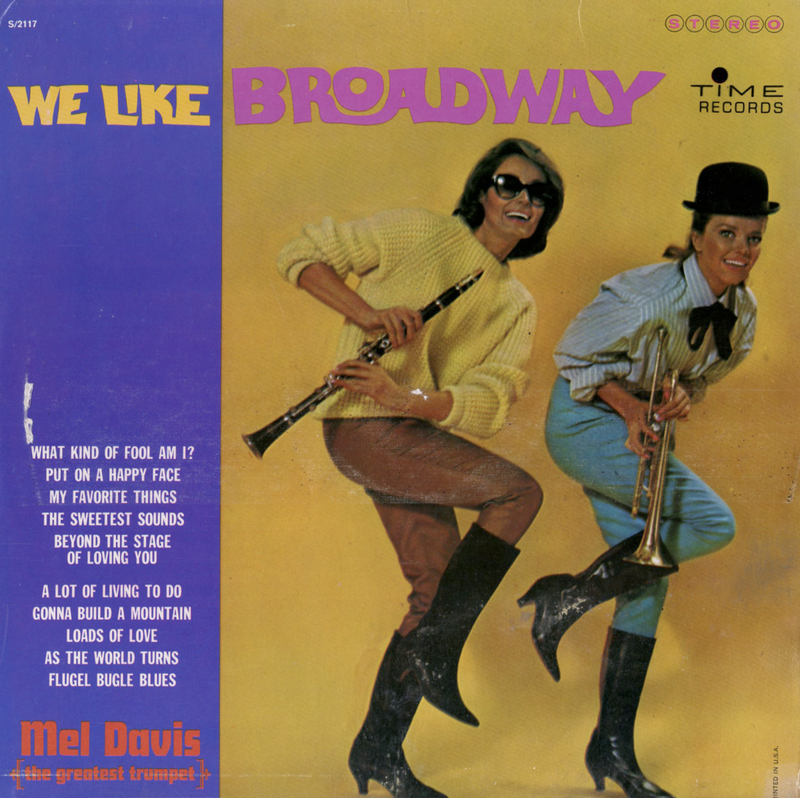 A joyful "progressive" mix of big band swing, jazz, woodwinds and a sense of humor. From the liner notes: Much too often – and especially since the advent of the "progressive" trend – jazz has become associated in the public mind with a deadly serious art, one much too cerebral and complex for comprehension by anyone except musicians who play it. There is certainly a good case for that view – especially since some artists have done their best to make it appear this way – but jazz, for all its seriousness, is, after all, wonderful fun. 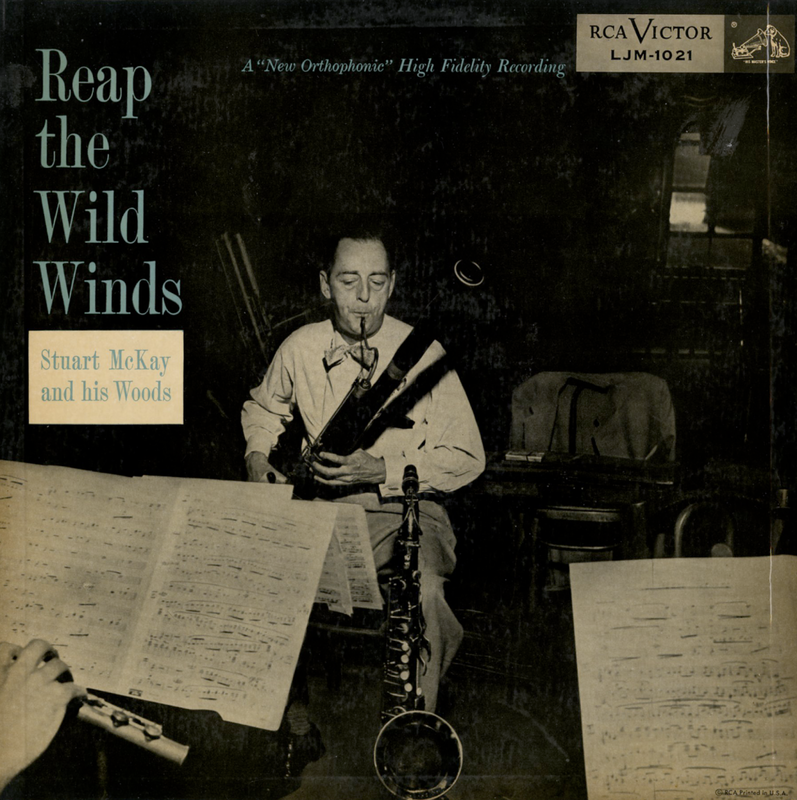 That particular fun – its swinging humor, its broad appeal, and the obvious enjoyment of the participating musicians – has probably never been demonstrated to such vivid effect as in these recordings by Stuart McKay and one of the most phenomenal-sounding bands ever assembled for the purpose of blowing jazz. 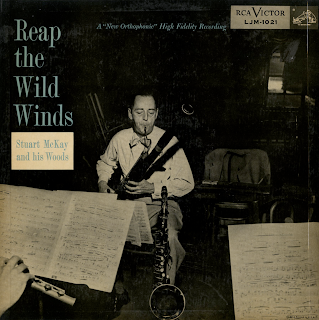 "Wild winds" is some of the wildest music yet waxed! Well executed small combo, extended track, lounge set. 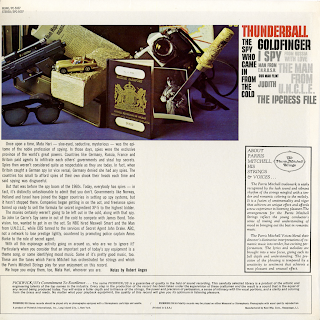 10 inch LP featuring 6 tracks on both sides that add up to a lot of empty disc space, enough space that Columbia could have included as many as 4 more tracks to the disc. 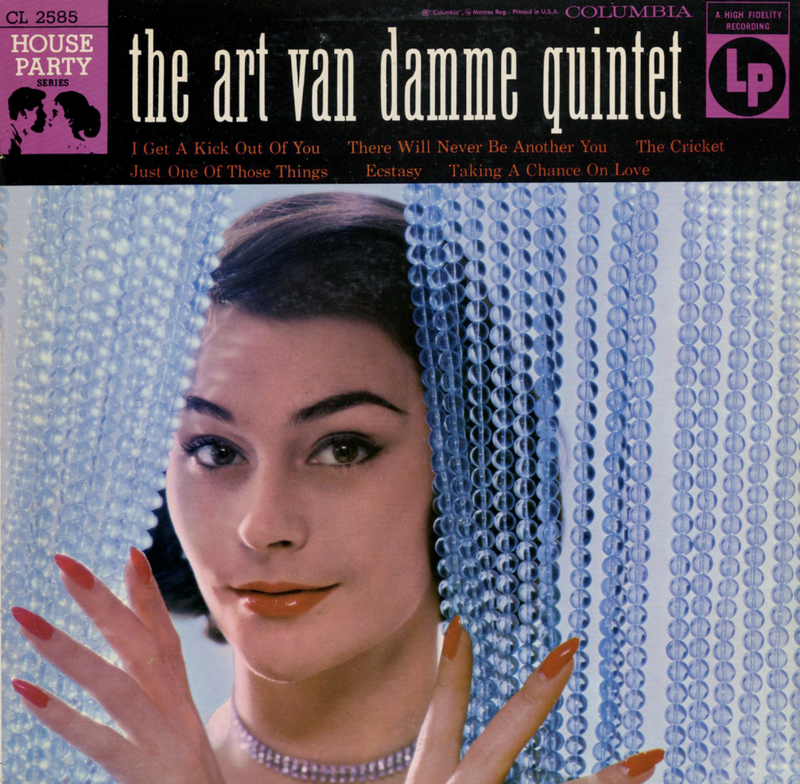 The tracks that Columbia thoughtfully did include in this package do add up to another great Art Van Damme jazz accordion set. 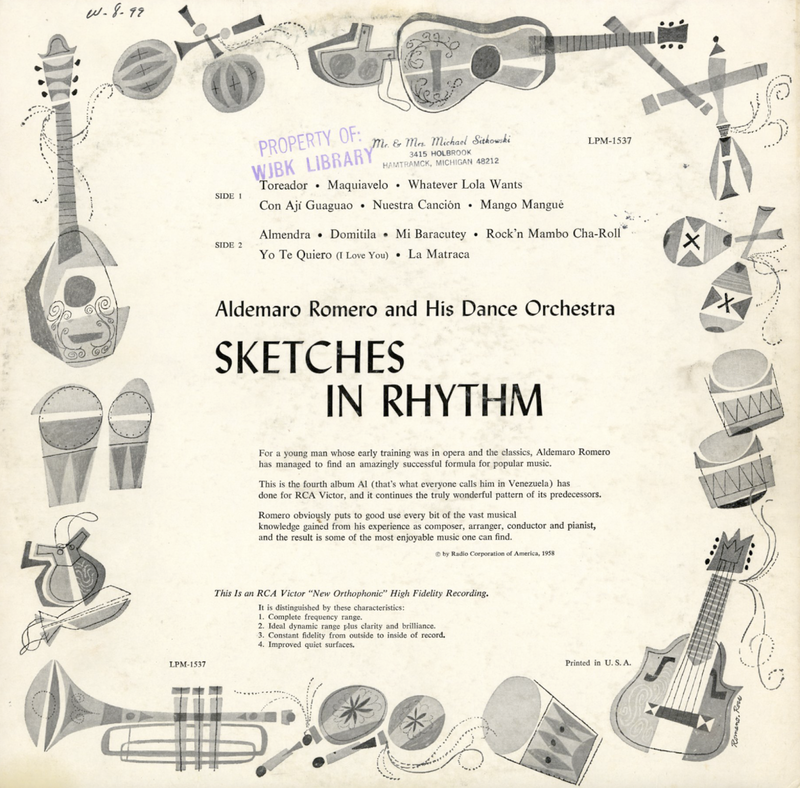 The tracks are available with other period trio and quintet numbers from online vendors so I will not be posting a sample. Presented here to share the cover and biographical information. One outstanding Shearing set, in my opinion, despite The Billboard review (below). Discovery 10 inch LP pressed on very dark, just translucent red vinyl. 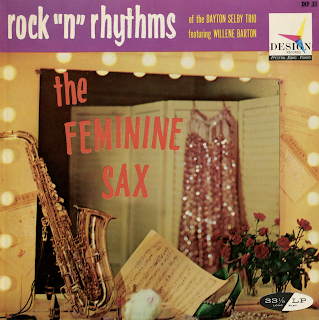 Personnel: Chuck Wayne - Guitar, Margie Hyams - Vibes, Denzil Best - Drums and John Levy - Bass. 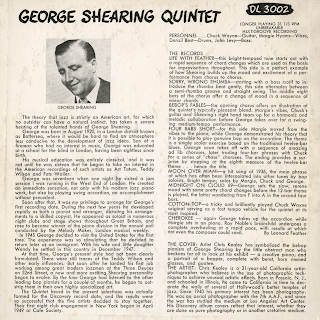 From the back cover: George was born in August 1920, in a London district known as Battersea, where it would be hard to find an atmosphere less conductive to the development of jazz ideas. Son of a fireman who had no interest in music, George was educated at a school for the blind in London, having been sightless since birth. His musical education was entirely classical, and it was not until he was sixteen that he began to take an interest in the American recordings of such artists as Art Tatum, Teddy Wilson and Fats Waller. George was seventeen when one night he visited a jam session I was running in the West End of London. 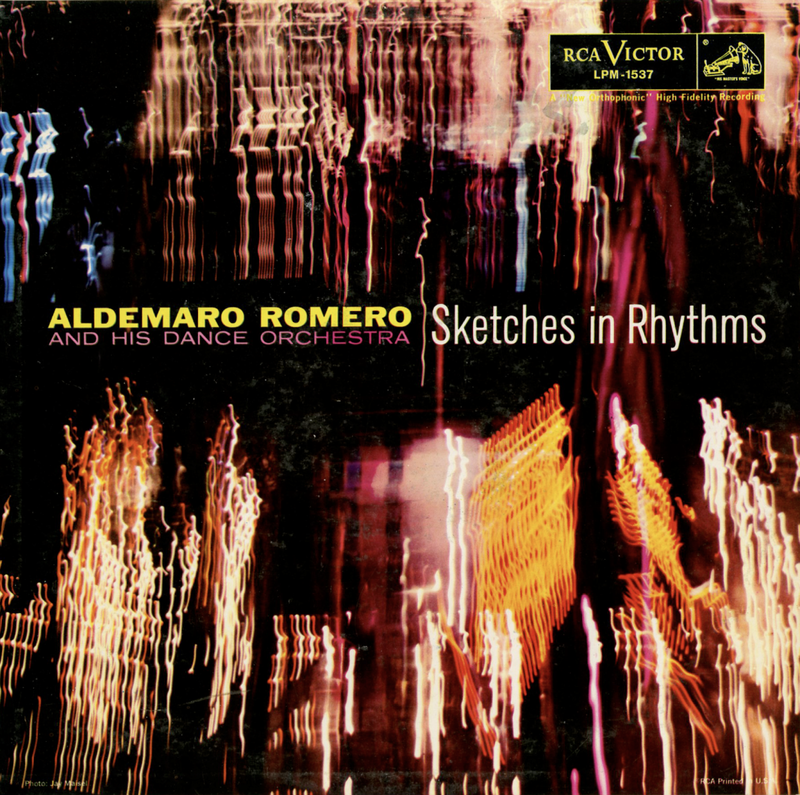 He created an immediate sensation, not only with his modern jazz piano work, but also by playing swing accordion, an accomplishment without precedent. Soon after that, it was my privilege to arrange for George's first recording date. During the next few years he developed rapidly as both a pianist and arranger, dictating his arrangements to a skilled copyist. He appeared as soloist in numerous night clubs and stage shows throughout Great Britain, and rose to become winner of the piano division in the annual poll conducted by the Melody Maker, London musical weekly. In 1945 George decided to visit the United States for the first time. The experience was so stimulating that he decided to return later as an immigrant. With his wife and little daughter Wendy he settled in this country in December 1947. At that time, George present style had not been clearly formulated. 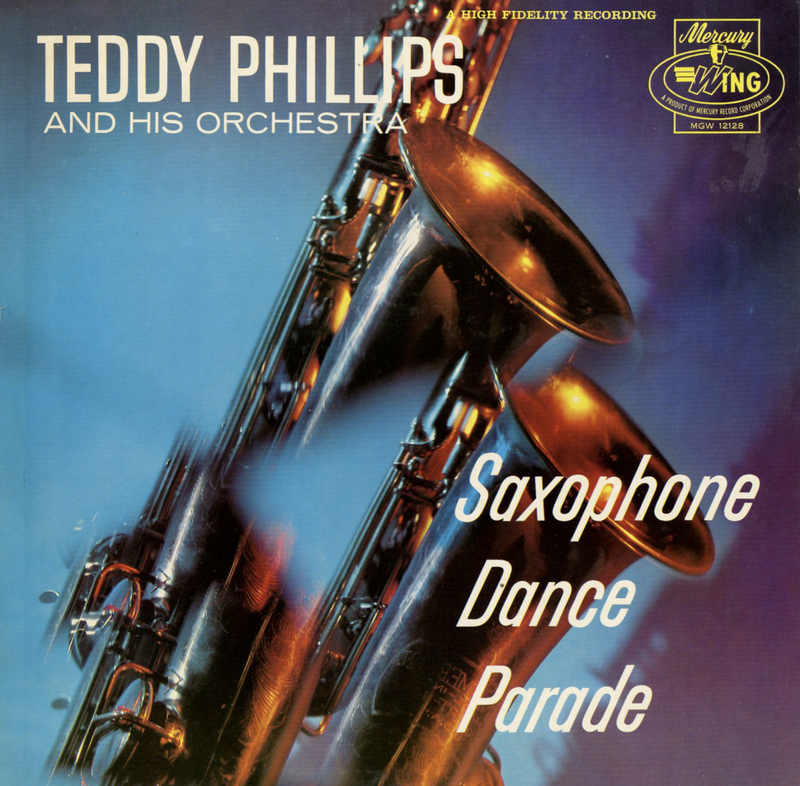 There were still traces of the Teddy Wilson and other early influences. But soon after he landed his first job working among the great modern jazzmen at the Three Deuces on 52nd Street, a new and more exciting Shearing personality began to evolve. By the time George has listened to the other leading bop pianists for a couple of months, he began to outstrip them in their own highly specialized art. 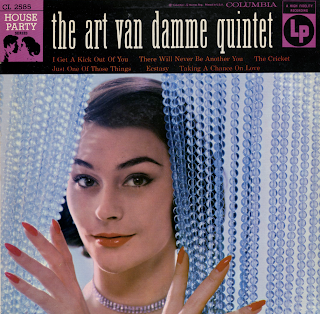 The Quintet heard in the present selections was actually formed for the Discover record date, and the results were so successful that the five artists decided to stay together. Their first night club engagement in New York began in April 1949 at Cafe Society. 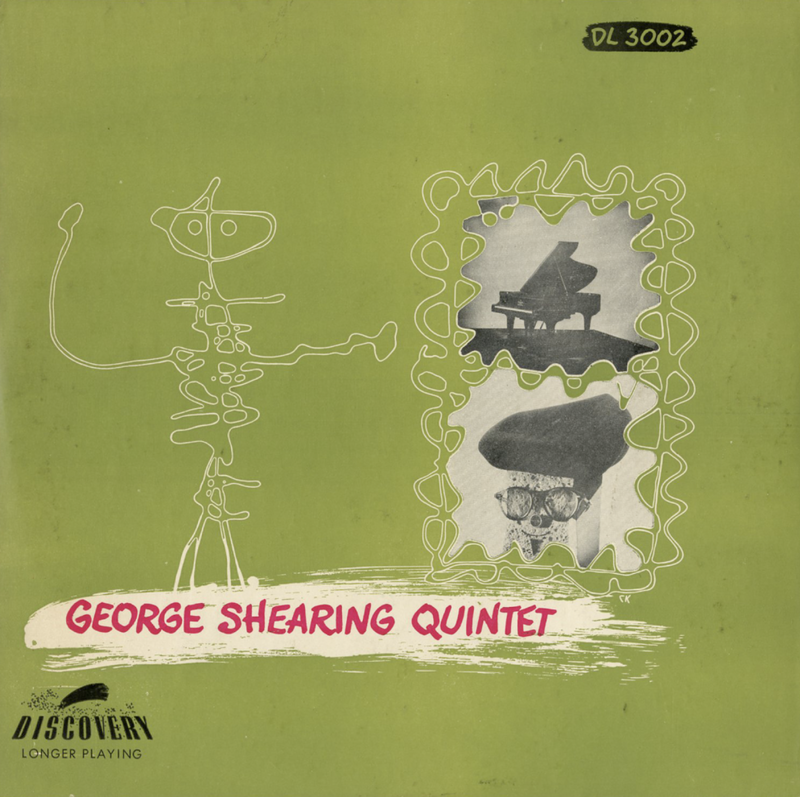 Also from the back cover: The cover artist, Chris Kealey has symbolized the bebop pianism of George Shearing by the little abstract man who beckons all to look at his exhibit – a creative piano; and a portrait of a bopper, complete with beret, horn rimmed glasses and goatee. The artist, Chris Kealey is a 31-year old California artist-photographer, who believes in the use of photographic techniques to achieve unusual artistic effects. Born in Passaic, N.J., and schooled in Illinois, he came to California in time to decorate the walls of several of Hollywood's better temples of jazz. Since 1940 his primary interest has been photography: He was an aerial photographer with the 7th A.A.F., and since the war has studied the medium at Los Angeles Art Center. His Discovery album covers reflect that interest, whether they are done as pure photography or in another creative medium. 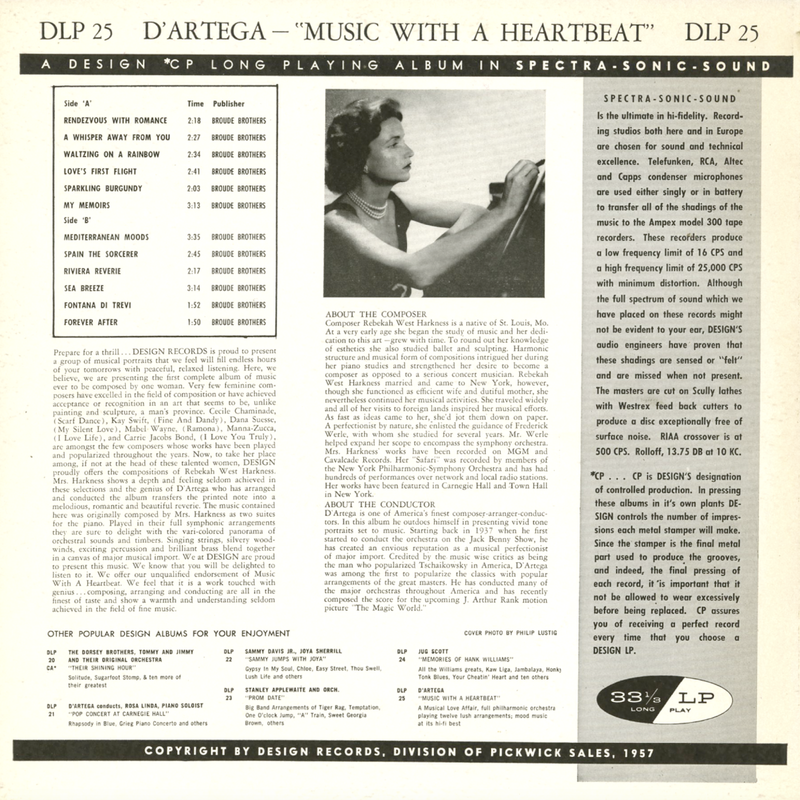 From Billboard - August 6, 1949 (Review of Discovery M-12 which was the 3 record 78 set released with the same, but modified cover art with the photos removed and replaced with abstract ink drawings): George Shearing, the brilliant young blind English pianist, is emerging as a leading commercial jazz performer. His records have begun to pick up sales impetus of late. This album therefore is well timed to fall in with the Shearing trend. 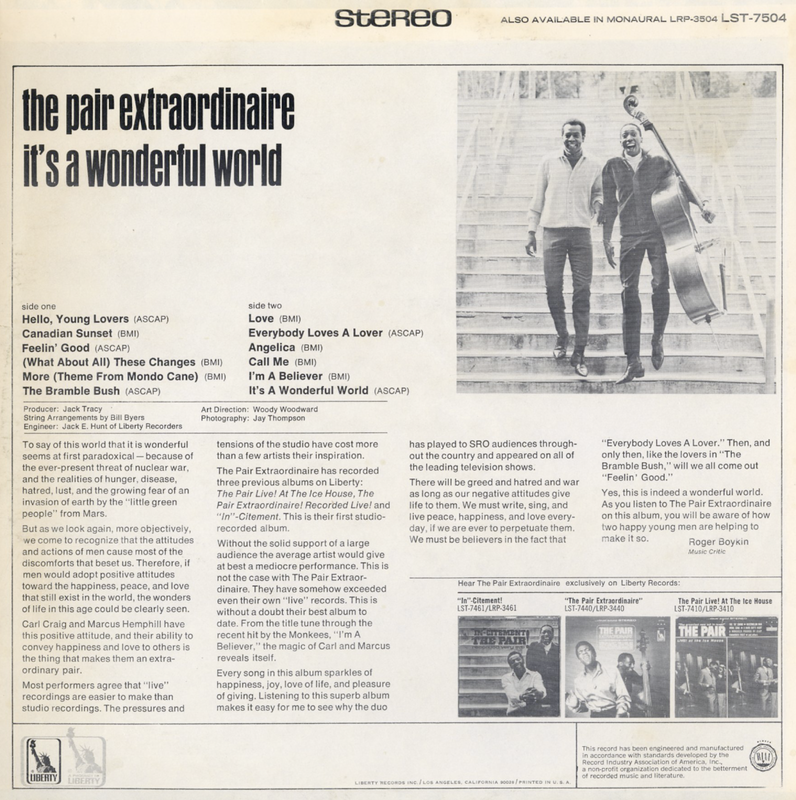 However, the (some copy issues here) it will probably sell, it is a disappointing presentation of the bright little quintet which is lead by Shearing and includes such stellar musicians as Denzil Best, John Levy, Margie Hyams and Chuck Wayne. This mainly because at least half of the compositions in the set are so complex as not to allow jazz freedom and feeling – greatest assets of the group – from entering these sides. Best of the sides are "Cherokee" and "Four Bars Short," a blues on both of which Shearing demonstrates his ability with an accordion. 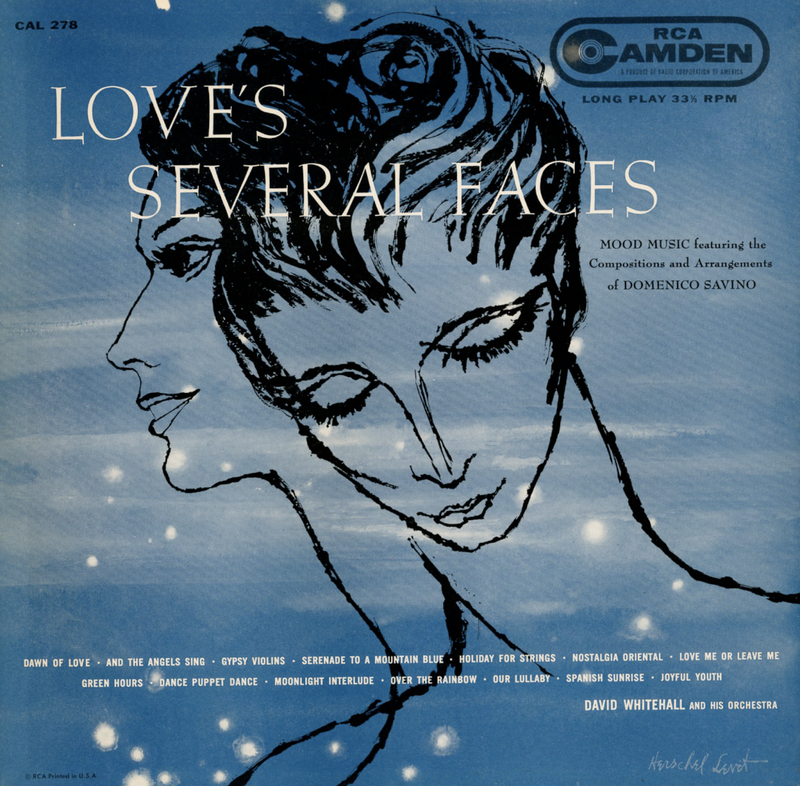 Striking album cover. Available on CD and YouTube, so I will not be posting a sample. Shared here to offer a look at the art found on the box and booklet. Extremely nice single Capitol 10 inch disc packaged in box that includes one eight page informational insert. 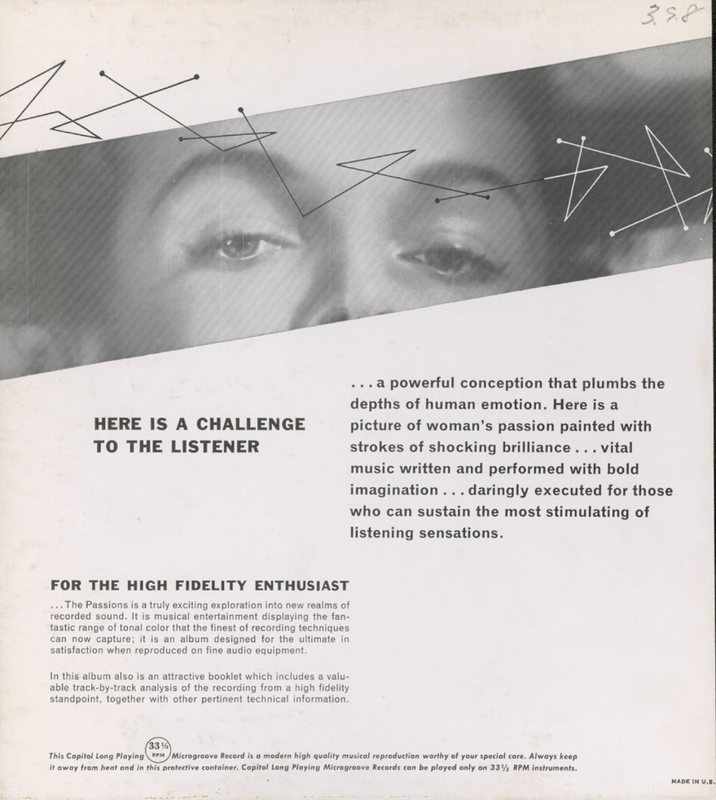 The booklet goes into detail, explaining how each track was conceptualized. Additional copy covers technical information and a description of FDS or Full Dimensional Sound. 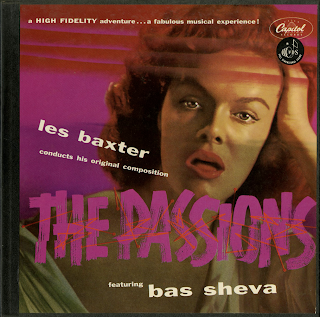 Baxter's answer to Yma Sumac's early 1950's popularity? 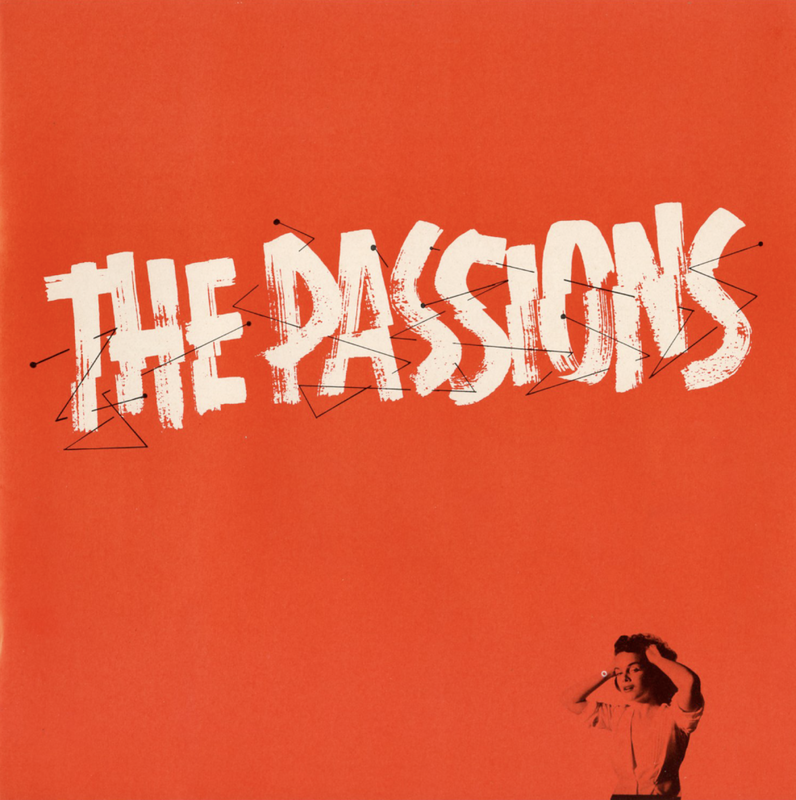 However, according to her entry in Wikipedia: The Passions was far too innovative and edgy and the album was not a commercial success. 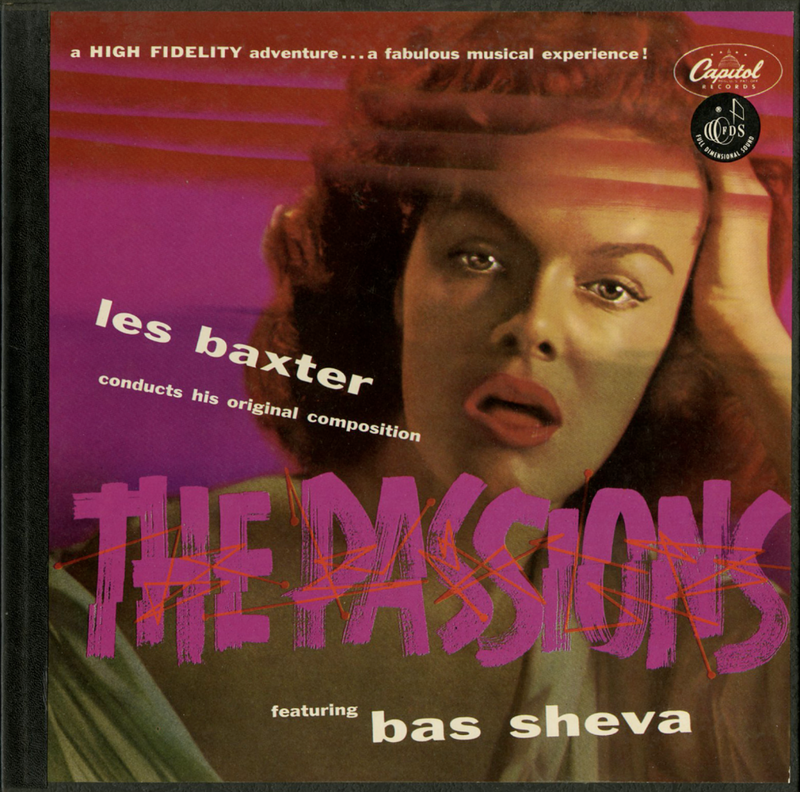 Despite this showcase of the astounding range of her voice, Bas Sheva never recorded again. From the booklet insert: The Instruments of The Passions is a follows: 2 trumpets; 2 trombones; 1 French horn (an additional horn was used on one recording session); 10 violins; 2 violas; 2 cellos; String bass; Harp; Piano (doubling celeste); Percussion (snare, bass drum, tom toms cymbals, wood blocks, triangle, tympani, bells, vibraphone, xylophone, timbales, conga drum, bongos, guiro, tambourine, castanets cabaza, maracas, and gong); Choir: three male, three female. 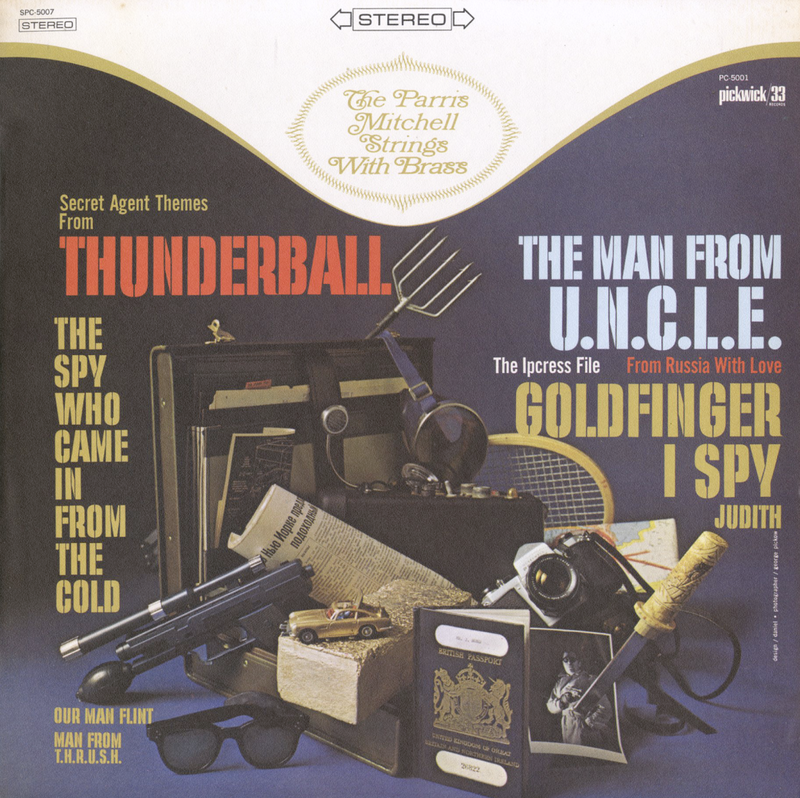 This "spy/secret agent" themed set sounds as groovy as similar period sets that I have collected over the years and this is easily the best "Mitchell Strings" LP I've listened to. 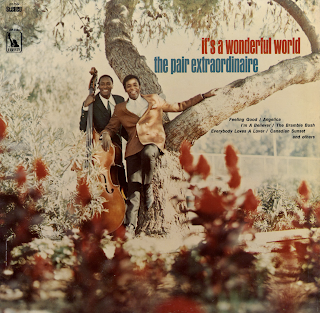 From the back cover: The Parris Mitchell trademark is easily recognized by the lush sound and vibrant rhythm of the strings mingled with a tender and romantic coloring to the melody. 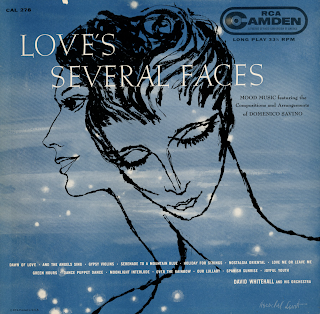 It is a function of sentimentality and vigor that achieves an unique effect and affords a new experience in listening pleasure. The arrangements for the Paris Mitchell Strings reflect the young conductor's sense of timing and understanding of mood in bringing out the best in romantic music. About the composer - Composer Rebekah West Harkness is a native of St. Louis, Mo. At a very early age she began the study of music and her dedication to this art – grew with time. TO round out her knowledge of esthetics she also studied ballet and sculpting. Harmonic structure and musical form of compositions intrigued her during her piano studies and strengthened her desire to become a composer as opposed to a serious concert musician. Rebekah West Harkness married and came to New York, however, though she functioned as an efficient wife and dutiful mother, she nevertheless continued her musical activities. She traveled widely and all of her visits to foreign lands inspired her musical efforts. As fast as ideas came to her, she'd jot them down on paper. A perfectionist by nature, she enlisted the guidance of Frederick Werle, with whom she studied for several years. Mr. Werle helped expand her scope to encompass the symphony orchestra. Mrs. Harkness works have been recorded on MGM and Cavalcade Records. 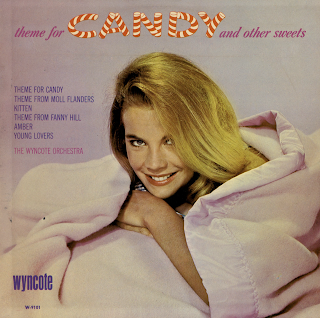 Her "Safari" was recorded by members of the New York Philharmonic Symphony Orchestra and has had hundreds of performances over network and local radio stations. Her works have been featured in Carnegie Hall and Town Hall in New York. About The Conductor - D'Artega is one of America's finest composer-arranger-conductors. 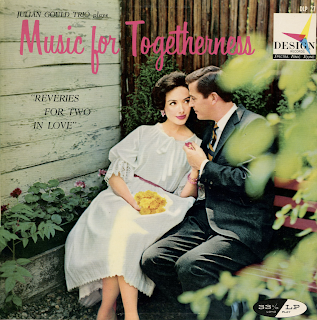 In this album he outdoes himself in presenting vivid tone portraits set to music. 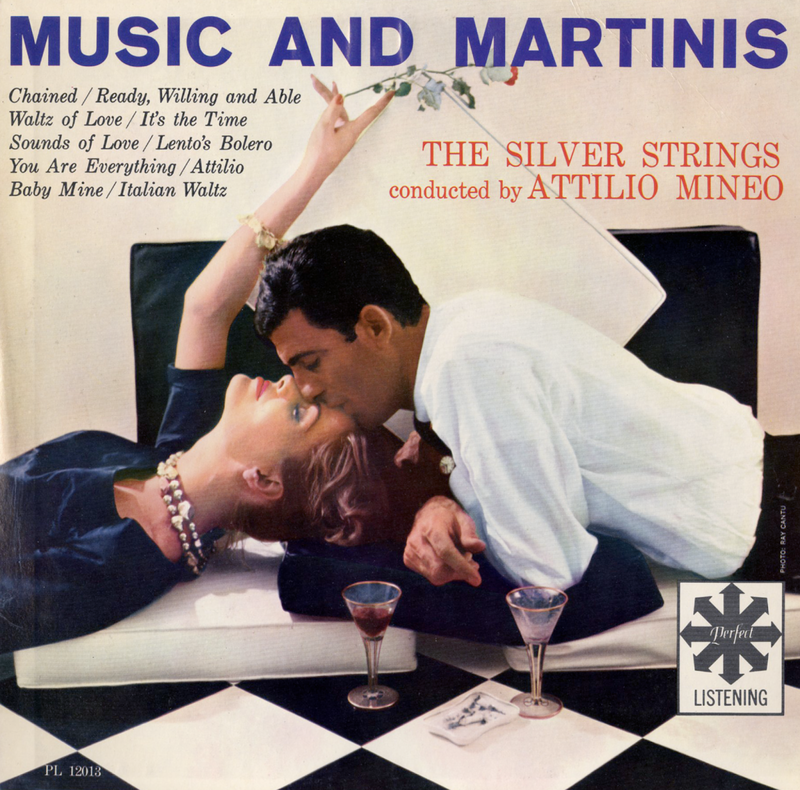 Starting back in 1937 when he first started to conduct the orchestra on the Jack Benny Show, he has created an envious reputation as a musical perfectionist of major import. Credited by the music wise critics as being the man who popularized Tschaikowsky in America, D'Artega was among the first to popularize the classics with popular arrangements of the great masters. He has conducted many of the major orchestra throughout America and has recently composed the score for the upcoming J. Arthur Rank motion picture "The Magic World." From Billboard - October 7, 1957: Altho the cover and title of this low-priced LP ($1.49) are obviously aimed at rack buyers, its content is classical, which may hamper it sales wise. 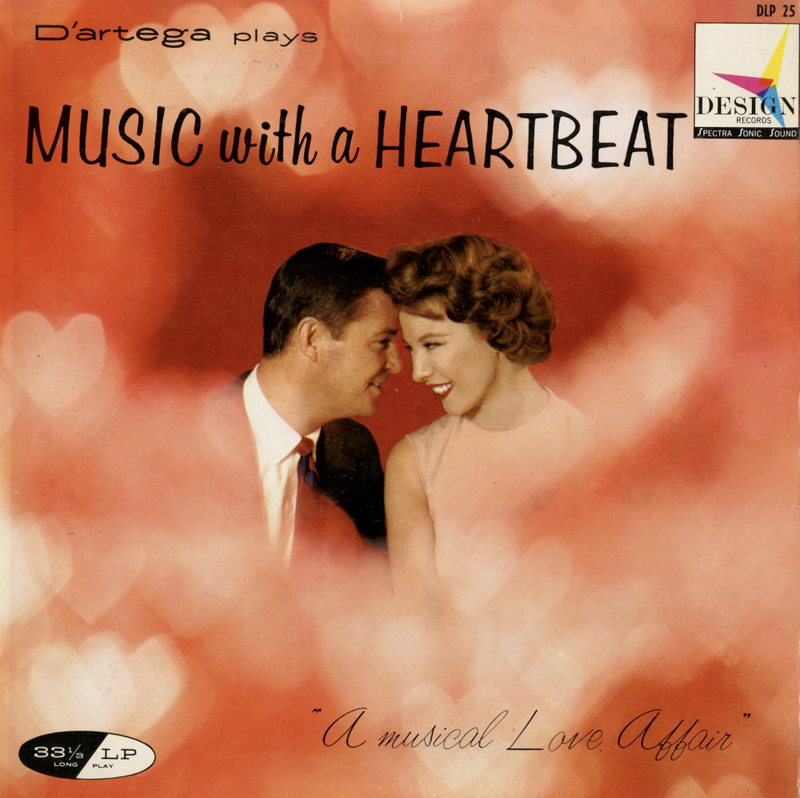 D'Artega offers lushly orchestrated, symphonic arrangements of selections from two suites by Rebekah West Harkness. 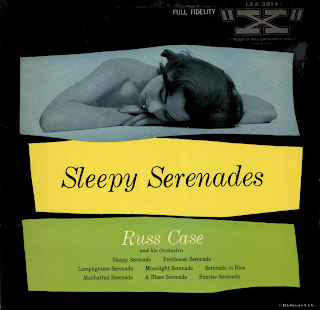 Excellent mood music for jocks with semi-classical programs, utilizing unhackneyed material. 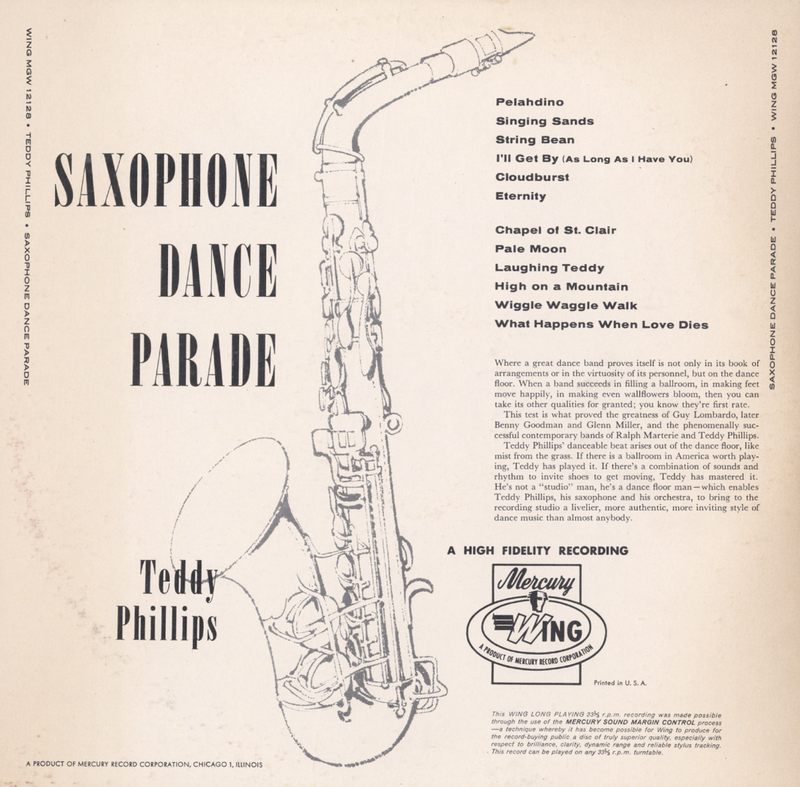 Phillips serves up an odd mix of "champagne" dance, lush strings, swing, swing with vocals to include western and teen pop influences. 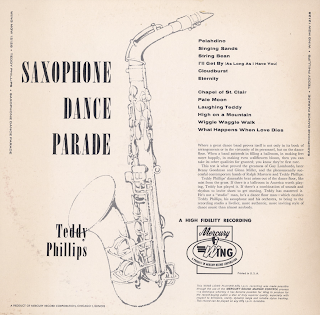 The assortment of arrangements actually makes the LP fun to spin because you can't guess what Phillips will do next. From the back cover: I first heard Julian Gould play in a service club in occupied Germany after the Second World War. I had walked in on an inspection trips as special service officer in the area. At the far end of the club there was a gathering of approximately fifty soldiers just standing around and listening to someone (I didn't know who at the time) play piano. I joined them and later induced Julian (the man at the piano) to play for boys in other areas thruout the command. When my tour of duty ended, I lost track of Julian Gould and it wasn't until last year when I was in Hollywood on a business trip that I heard those magic fingers of his, once again, tempt lovely sounds out of Mr. Steinway's best. We kept in touch and when I joined DESIGN in charge of Artists and Repertoire I convinced him to record for us. He has, and now you, too, can know why I was so anxious to have this outstanding American artist join our expanding circle of musical groups. 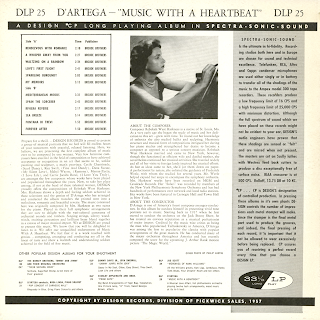 From Billboard - October 7, 1957: The $1.49 price tag is the attractive feature here. Customers will probably be lured by the lower cost. The set is a pleasantly listenable grouping of schmaltzy romantic tunes. Gould's paying is in a sort of Cavaillaro vein. * Herbie Helbig, Archie Alleyne and Hughie Currie replacing Appleyard's supporting musicians on these numbers. From the back cover: Peter, who had become very well school as a drummer in England, in Bermuda taught himself to play vibes. This he accomplished during his two years' stay there. Peter was able to adapt the showmanship of drums and the musicianship of vibes into one cohesive act – which is the best way to express it – and which was the best way to get a job with Billy O'Connor, in Toronto. While still with Billy's group, Peter began working with the Cal Jackson trio on a weekly TV show. 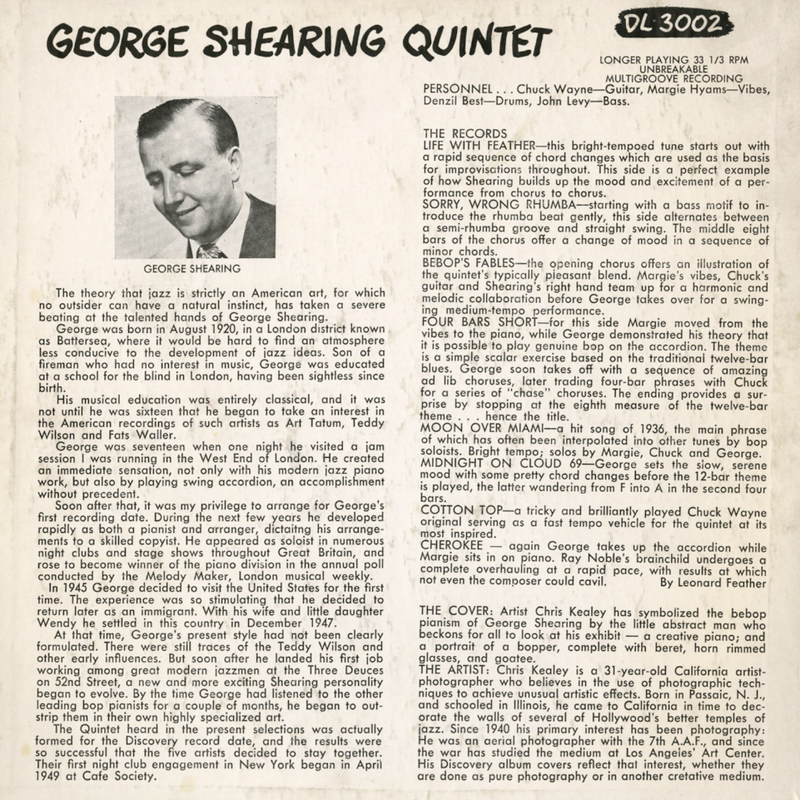 During the time he worked with this group, they became one of the most popular jazz combos in Canada – very probably because of Peter, who had the foresight to perform as a showman as well as a musician – a thing that so many of today's musicians neglect to do. During Peter's sojourn with both of these groups, he was improvising and developing; and consequently decided to lead his own combo. The popularity of the Peter Appleyard Quartet was proved when they performed nightly for nine months in Jackie Rae's Stage Door, in Toronto. They were featured many times on Coast to Coast TV shows, and eventually were successful in getting an RCA Victor recording contract. (Which, incidentally, is the only Canadian Jazz contract of its kind in Canada, with the exception of Oscar Peterson's made some time ago). So much for the group – now, let's look at the man – Peter Appleyard. This personable young man deplores the "funny hat" type of performer, but as we have pointed out, he most emphatically feels that a leader must be a showman as well as a musician. He has come a long way from the time he was 14 year old and a drummer in Cleethorpes, Lincolnshire, England. 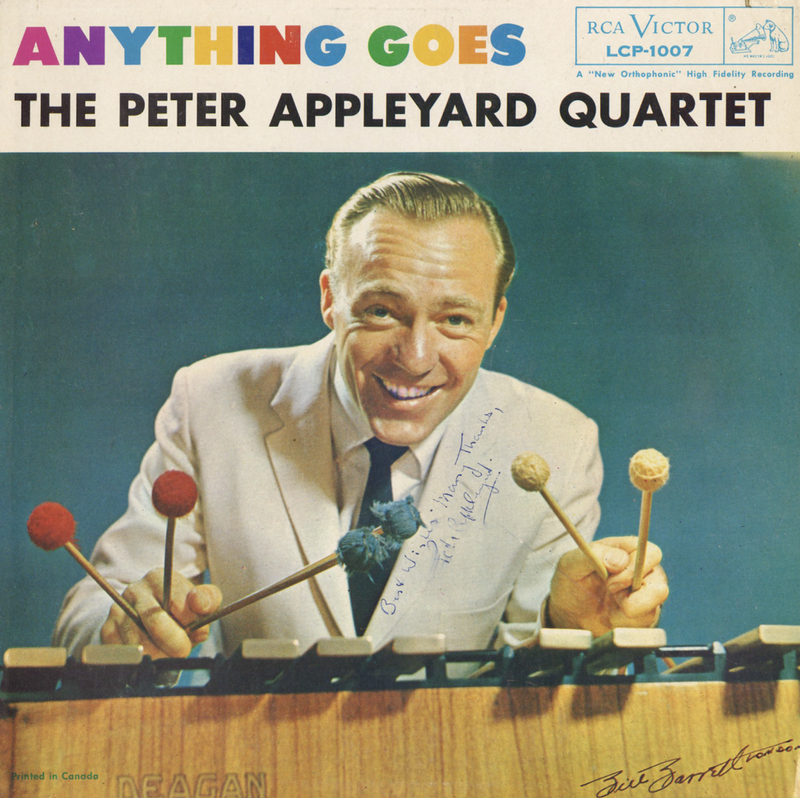 Probably his greatest influences have been Lionel Hampton and Red Norvo; but he has managed to retain his own style, which is unquestionably Peter Appleyard. Pete has a strong desire to remain in Canada; however, current offers from the U.S. may necessitate his departure from that country. Apart from practicing every day, Peter has time for two hobbies – photography and horseback riding, both of which he spends as much time at as possible. This set is available from online vendors so I will not be posting a sample. Shared here to present the original cover which is not available with the digital downloads. 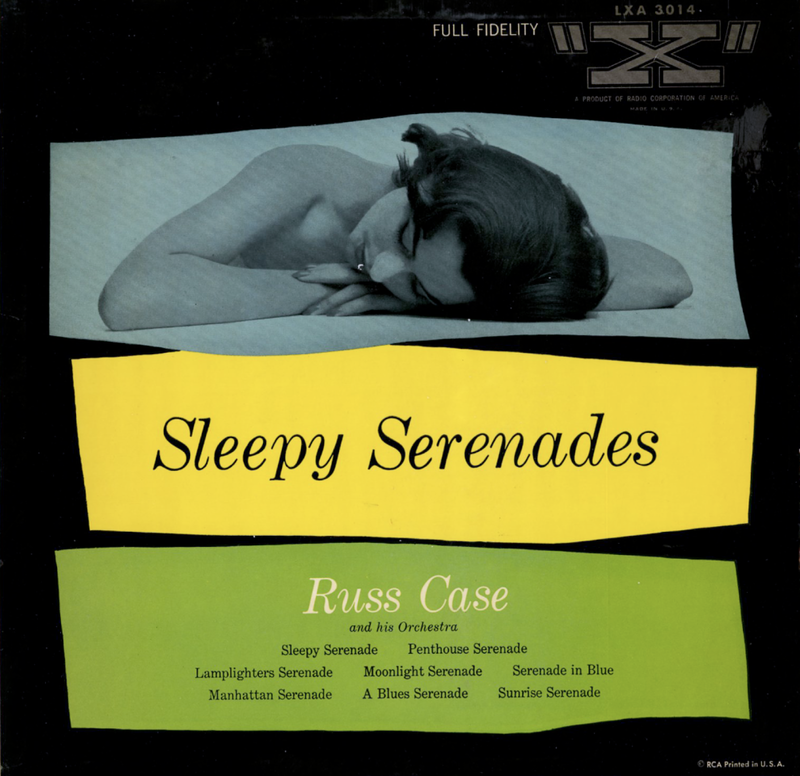 Lush mood set that reminds me somewhat of Les Baxter's work form the same period. 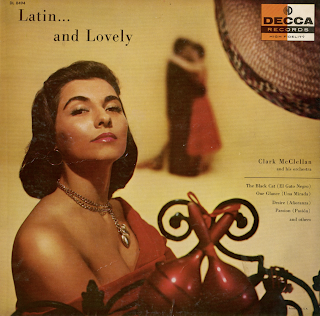 There are few online mentions of the talented McClellan who seems to have produced only this LP package and then disappeared. 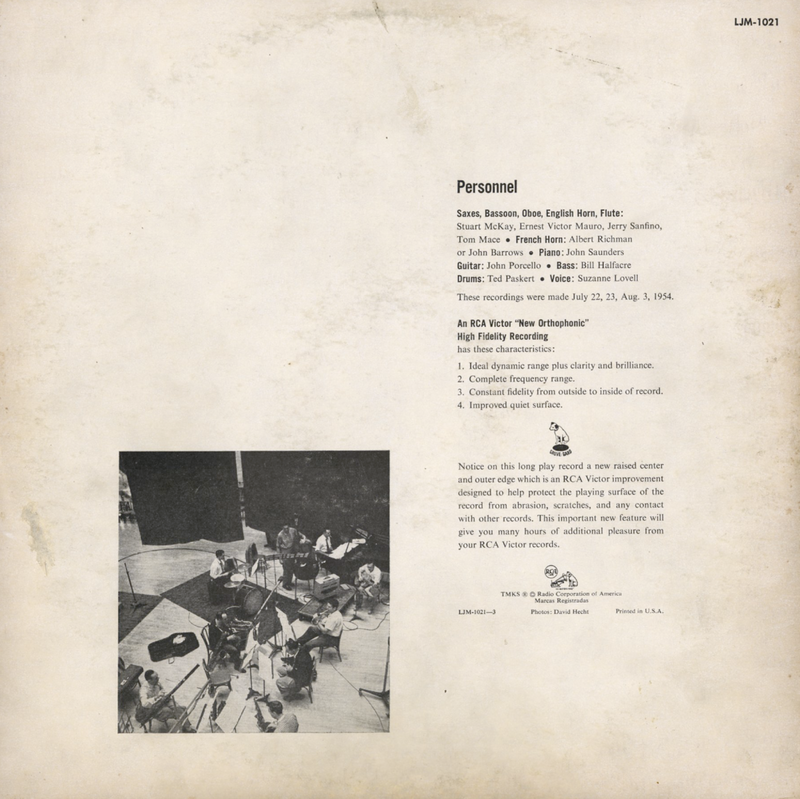 From the back cover: The fact that McClellan is a composer, as well as an arranger and orchestra leader, assures the distinction of this album. Born in Grand Rapids, Michigan, Clark attended the Michigan State Teachers College, where he spent most of his time at the Conservatory Of Music. He had played the piano ever since he was six, had entered the Berger School of Music three years later, and had studied there for seven years; he had organized his first orchestra during high school days and had continued his musical activities at college, studying to become a teacher. He perfected himself in such technical matters as musicology, counterpoint, advanced harmony, and orchestration, until he entered the service of the Merchant Marines. After a period of conducting and broadcasting, McClellan became musical coordinator and pianist on the Kay Kyser and Jack Haley TV shows. His progress as arranger, conductor and composer has progressed with simultaneous success. 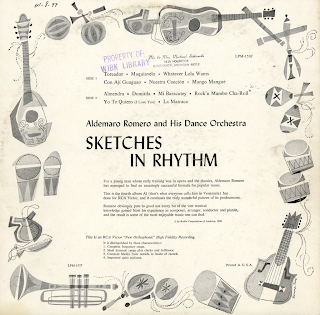 From the back cover: This is the fourth album Al (that's what everyone calls him in Venezuela) has done for RCA Victor, and it continues the truly wonderful pattern of its predecessors. 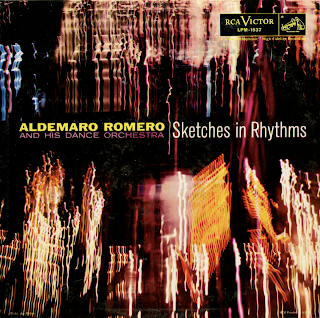 From Billboard - February 17, 1958: Venezuelan Romero cut this album in Cuba. 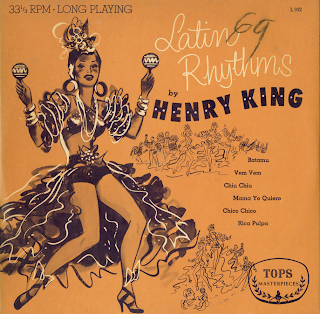 The work is a big one and it has an exceptionally bright sound on the collection of Latin Rhythms. Solo and group vocals in Spanish punctuate the offerings. 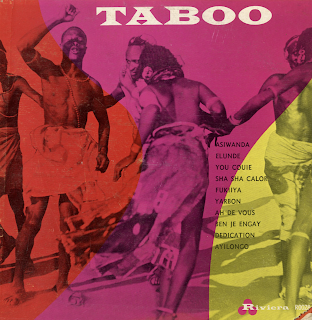 Danceable material with a slightly "far out" cover that attempts abstract pictorializing of rhythmic ideas. Can sell to the Latin minded customers. Typography: The Composing Room, Inc. 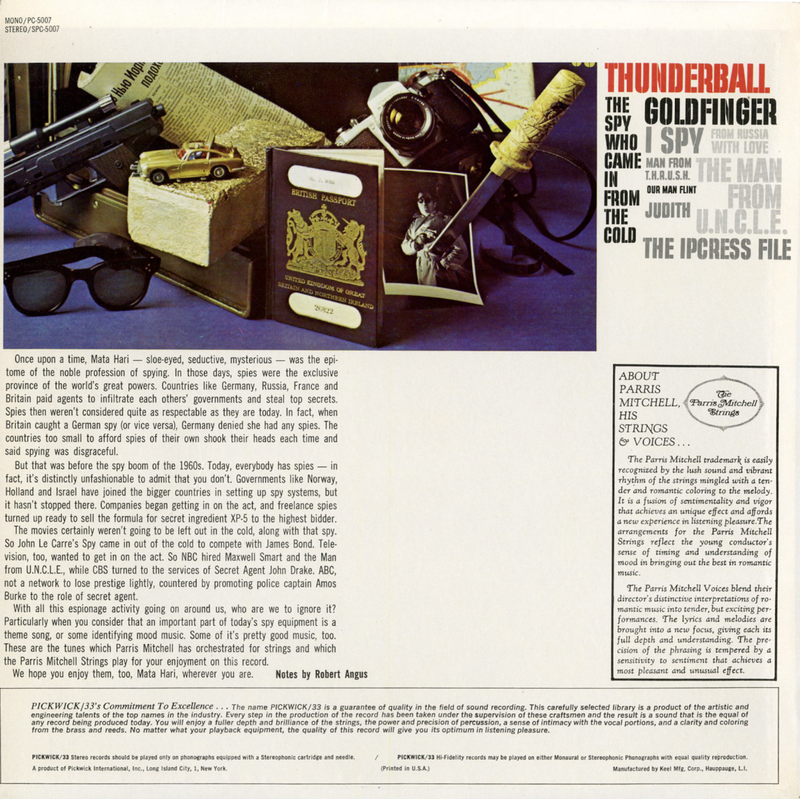 Album Design: Moskof - Morrison Inc.
Printing & Fabrication: Globe Albums Inc.
From the back cover: Mel Davis started out as a top club musician. Then his consulate artistry on trumpet created a demand by all the record companies to be on their recording sessions. He now is considered one of the top men in he field. Mel is a native Philadelphian. He was born in 1930 and was an exceptional student at the Curtis Institute, where he studied composition, theory and orchestration together with the trumpet. 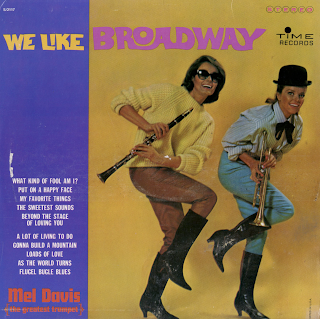 Mel also studied privately with Rosenfeld, who is the first trumpet player with the Philadelphia Orchestra. This accounts for his impeccable technique and full, rich tone. After graduating from Curtis, Mel wen to Temple University for advance studies. While studying music, Mel was putting his training into practical use by playing numerous club dates in and around Philadelphia. During this time, he played a short stint with the St. Louis Symphonetta which, according to Mel, gave him a wealth of experience in meticulous ensemble playing. When Mel came to New York, his articulate talent was quickly recognized by all the top leaders and contractors. 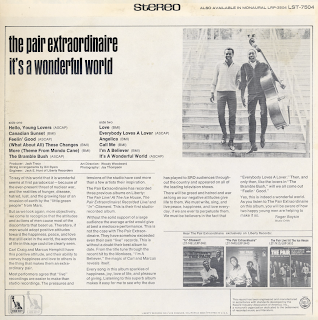 From the back cover: The Pair Extraordinaire has recorded three pervious albums on Liberty: The Pair Live! At The Ice House, The Pair Extraordinaire! Recorded Live! and "In"-Citement. This is their first studio-recorded album. Also from the back cover: Carl Craig and Marcus Hemphill have this positive attitude, and their ability to convey happiness and love to others is the thing that makes them an extraordinary pair.